I'm with Retrocrush: When are the Banana Splits coming out on DVD? Thankfully, they're rerunning the series on Boomerang, and Kelly asks often to watch "na na na's." I now know the series freakishly well, much better than I did as a kid. Tooly, on "The Three Musketeers" cartoon, seriously needs a punch in the face. "Arabian Knights" is a little better since it doesn't have a kid sidekick (just a midget donkey), but it's odd to me that they never noticed the villains all are identical. "Micro Ventures," or "Micro Adventures" as Drooper announces it, is the one where the scientist dad and his teen kid get shrunk down and go do things like explore the wonders of their lawn while a housecat tries to eat them. I swear that one only aired like twice. On "Danger Island," the villain looks pretty non-threatening with his pink polka-dotted bandana, but supposedly he made Chongo (as in "Uh-oh, Chongo!") mute, which is a little on the uber-creepy side for a kids' show. 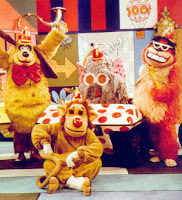 And best of all, of course, is the Banana Splits themselves, whether they're having a wacky race in their banana buggies (which all sport tails) or performing another of their Brady Bunch-esque bubblegum pop tunes.